Google Thewallinna and other creatures: The Soma is hot this summer! I wanted to sew a cool swimsuit! My doubts about purchasing this pattern disappeared when a friend said:"Hurry up! The summer will end in no time!". The pattern is the Soma swimsuit by Papercut Patterns: the sexiest and the trendiest swimwear pattern out there at the moment! If you know anything cuter, more flattering and easy to sew, give me a shout. When it comes to the sizing, I find that Papercut Pattern adds a rather generous ease. With this in mind, I cut a size XXS for both top and bottom, although according to their size chart my upper body measurements corresponds to a S and the lower part would be a M. As the result, the swimsuit fits well enough. Both the lycra and the lining come from the Okadaya, one of my favourite craft shops in Tokyo, where I bought it last summer. Due to the fabric's thickness and one additional layer of lining, I could feel the bulk in some areas, particularly around the waist. I wish I knew some tips to eliminate the bulkiness. Anyone? When I started researching online sources for the fold-over elastic (FOE) and bra strapping, it turned out that I would be better off making my own than having them shipped to Ireland. Most US websites' estimated shipping added up to $50 and UK sites offered a mere £20! Instead of making tons of silly purchases to justify spending $50 on shipping, it took me less than one hour and some self fabric to produce 3 metres of straps! I used this tutorial, Method 1, for the straps. As for the FOE, I cut a 3cm wide strip of fabric on the crosswise grain and sewed together folding in two, as if I had made a wide spaghetti strap. I really like the high rise bottom part and how it hugs my body. Last weekend I have baptized it in the Irish Sea! Good news though, the swimsuit did not fall off in the sea! By the way, the Papercut Collective girls are in the midst of running a Soma tutorial. So hurry up and buy your fabric and supplies because it may ran out: everybody needs a Soma! This is fantastic. I got my soma cut for ages but after looking at yours I got excited to finish mine. The fabric is so cool. Looks amazing. I agree this is the trendiest suit available. I wish more companies would offer suits. I know not everyone likes to sew them but they can be fun instant gratification and I'd just like more options. I like the look of all one fabric, I did the same with my straps. This looks so cute. I love the fabric, and your self made strapping is really effective. You've made a really timeless and classic suit! Wow! This looks fantastic on you! Hot! I think this is the best Soma I've seen so far! Wow! This swimsuit looks AMAZING! Good thing about sewing swimsuits is that you don't need lots of fabric + it's relatively easy to find reasonably priced fabric and notions. I feel like sewing more swimwear this season! This looks so great on you! I'm ashamed to admit that I have FOUR pieces of a swimsuit cut out (both Soma bikini tops, the Soma bottom, and an Ohhh Lulu bottom) all in the same fabric, but I've only sewed the Ohhh Lulu bottom and now summer is halfway over! I need to get cracking!!! I prefer the look of the self-fabric instead of FOE here- it looks great! Wow! Polka dots! And the best happy red ever! *^o^* You look amazing, and I wish I could swim in the sea, too. oh...I really wanted to make that pattern too. Given that I still have two projects on my list and we´ve been having an awful summer I guess I will wait next year. The pattern looks great on you. I hope the sun stays there for much longer! I decided to swim every weekend, including autumn, winter, spring and summer. Hopefully, this swimsuit will keep me company! Four swimsuits, you said FOUR????? Girl, hurry up! I so want to see them! Self-fabric binding was the cheapest and fastest (time-wise) option. But, to be honest, it was a bit challenging to keep my sewing line straight due to the qualities of lycra. Still, this option is worth a try! Your swimsuit looks amazing! You look pretty! I haven't noticed that Papercut patterns started PDF versions of new products, so thank you for making me notice about it too. Way to go, Inna, this is fabulous! Red, spotty, AND functional :) I think ditching the FOE was a good call- your straps look great! 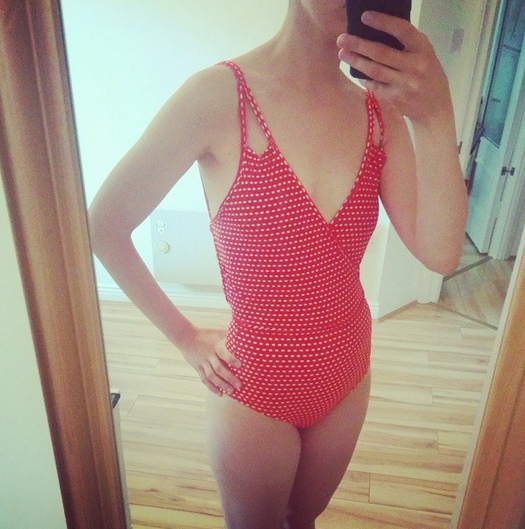 Its not fair - a lovely swimsuit pattern emerges in the middle of our winter! Too me ages to realize that I'd rather make my own FOE. I can't believe that shipping fees are so crazy expensive! Are there any nice fabric/notions stores in SG? Although I am not a big fan of taping, I also like PDF: one click and 5 minutes later you have your pattern! It surely doesn't look bulky! Great fit, print, everything :) I'd forgotten about Katherine's other blog - thanks for sharing that link! Ok. So where is the bulk at your waist. You've done an amazing job. You certainly make a case for not needing FOE. Your summer is like our winter. Dude, this is EPIC! That fabric is amaze and you have done a rad job! What a great swimsuit. I love the colour you chose and the fit is perfect. I love everyone about them - maybe I need a new one of these when summer rolls around here.